The German big 'cats'; who would not be impressed by them? The total amount of these tanks that were constructed was not very much, but their influence on so many battlefields went far beyond mere numbers. There are so many stories of Tigers limping back to their own lines with shell marks on them too numerous to count. They were bent, bruised, and battered, but still capable of taking out any Allied tank. They are a mechanical marvel. All it takes is to watch some tanks go through their paces on the TV to see the difference. All the other tanks lurch and clank and sputter. The Tigers go through their paces like a Ferrari. Otto Carius said that you could steer it with one finger. Over engineered, certainly. Deadly in the hands of a veteran crew, almost certainly. This book is a bit of a amalgamation. It is about the history of all of the Tiger tanks and their crews that fought on the eastern front in 1944, but it is also about Tiger I-II models. There are six different models of Tiger Is and IIs, and also a Sturm Tiger. All are from different world class model makers, and they are fantastic. They are enough to make you get your poorly made Tiger models and throw them away. The weathering and the detail is superb. The dirt and snow in the first models tracks are unbelievably realistic. There are also ten pages of excellent side shots of different Tigers for modellers to use in their builds. Then there are pages of the Tigers that are on sale from all of the different model companies. Dragon, Italieri, Tamiya etc, they are all here. Speaking of Tamiya, did you know that the company started out as a sawmill? They started a sideline business of wooden ships and airplanes. The side business did so well they closed down the sawmill. The book is filled with that fact and so many others. After the model companies are listed, there are a few pages of specialist companies that build add-ons to enhance your model. Metal, resin, and brass - you name it, it is listed here. The unit histories are usually about a page in length. The book goes on to state and show all of the changes the different Tigers went though during their three years of construction. From a technical standpoint the book is a winner. 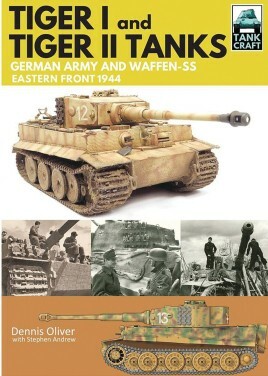 Throw in all of the unit histories and then add the modelling, and it is a superb book on the Tiger I-II tanks. This book is part of the Pen and Sword 'Tank Craft' books. The book is really a showcase of the modellers and their builds, and gives the rest of us a shot in the arm to up our game on our next Tiger tank. I will be doing a review of another 'Tank Craft' book: 'Sherman Tanks British Army and Royal Marines Normandy Campaign 1944'. I cannot wait to see what the modellers have done in this one. Thanks so much for the kind words Mr Peterson. As a first book in this series the editors and I agonised over the content, layout, photos .........well, just about everything. Your feedback certainly makes the effort worthwhile. Hope you enjoy the Sherman book. Best wishes, Dennis Oliver.